Stilt Walkers for Events in Kitchener, Cambridge, and Guelph. 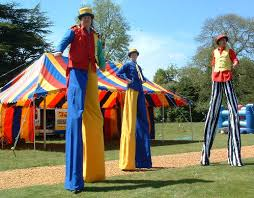 A Stilt Walker can add entertainment to any event, especially events with large crowds. Our Stilt Walkers will juggle and/or make balloons while walking on stilts. The performance can easily be seen because the Stilt Walker is above the crowds. There are three main types of Stilt Walkers. First, there are Stilt Walkers who do not talk but let their costume provide all the entertainment. Second, there are Stilt Walkers who talk and interact with the crowd. Kids enjoy the chance to speak to someone so tall! Lastly, there are Stilt Walkers who interact with the crowd and also perform a skill - most commonly, juggling. Big Smiles Company offers Stilt Walkers who interact with the crowd and perform a skill - whether balloon twisting and/or juggling.